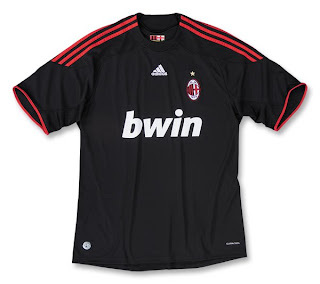 Paolo Maldini will not be wearing these next season, and the Rossoneri may have a new leader on the bench. Regardless of what players come and what coaches go, one thing is certain: AC Milan will be competing once more in the UEFA Champions League, where they have always excelled. 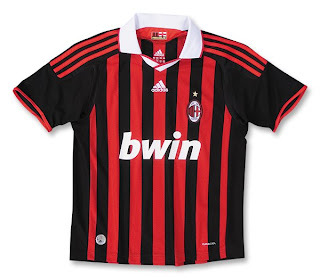 The red and black striped shirt gets a new retro-styled white polo collar for the 09/10 season. 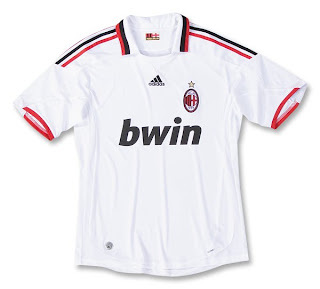 The traditional white away shirt for Milan gets a style makeover for the 09/10 season, with an open fold-over rossoneri-trimmed collar. Cool black change shirt with epaulette-style shoulder mesh panels. All three officially licensed shirts made by team kit provider – adidas feature embroidered AC Milan team badge and championship star over your heart, embroidered adidas logo at the center chest and screened bwin sponsor logo below, and made with ClimaCool® - advanced material engineered to reduce heat and moisture build-up, allowing increased comfort and performance – to keep you feeling cool and comfortable when you're cheering on your Rossoneri!